Swimbait fishing is EASY! Spring has arrived and its time to catch the biggest bass of your life! We explain how to choose the right swimbait for your conditions, when and where to throw it, and how to make sure your gear is up to the task. Stop guessing and start catching swimbait fish, its really this simple. We break Spring swimbaits into 4 categories: Soft baits, multi-jointed hardbaits, open water glide baits, and cover glide baits. Owning a bait in each of these categories insures that you’re prepared for nearly any situation that can be thrown your way. Understanding when to throw each one is what this video is all about. Matt keeps the selection extremely simple and recommends staying with bold colors to attract more fish. 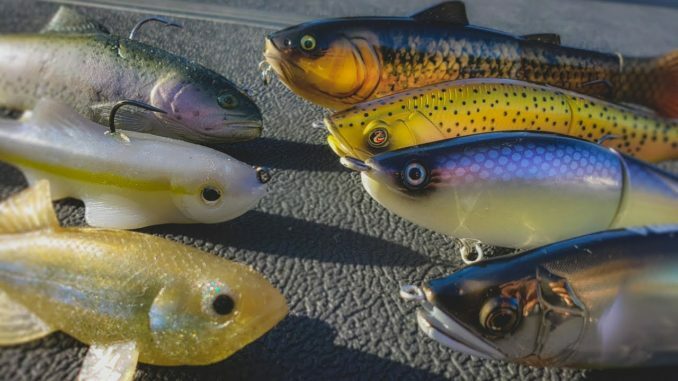 Below is a breakdown of baits by style, including color recommendations. We also included links to the rods, reels, and other swimbait gear.